(CNN) -- For an injury that is largely invisible, it is no small irony that a new test to detect concussion involves the eyes. The two-minute test, which tracked subtle vision problems in athletes with suspected traumatic brain injury, was a near-perfect gauge of whether a concussion had occurred, according to a new study. "Fifty percent of the brain's pathways are devoted to vision," said Dr. Laura Balcer, study co-author, who added that eye movement provides a window into overall brain function. "By doing this test, we can potentially catch a lot of what's going on with overall cognitive function and how impaired an athlete can be following a concussion." The test, called "King-Devick," is based on subtle, constant vibration in the eyes, called saccadic movements, which allow them to focus on specific spots. A problem with the eyes' ability to track and focus suggests impairment involving brain pathways. 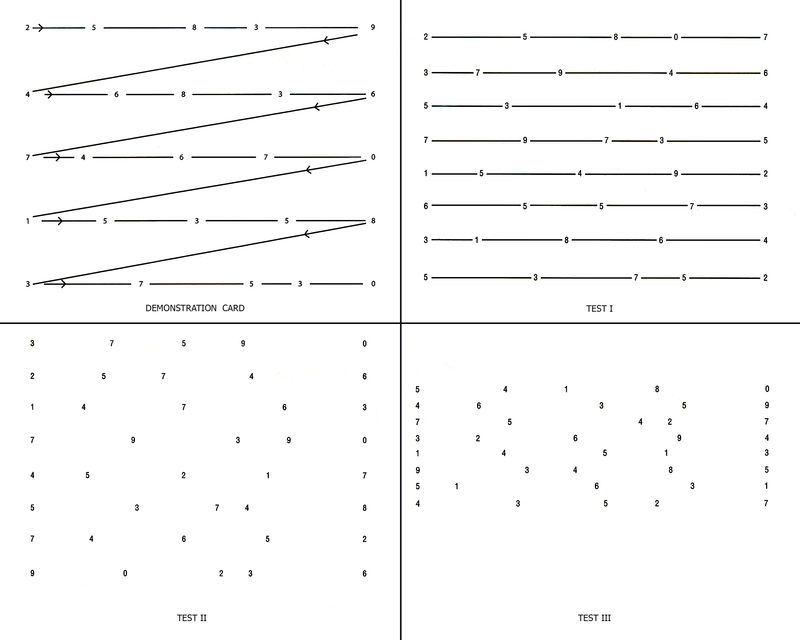 With the K-D test, a person reads rows of single-digit numbers arrayed on a ... . Some numbers appear in a straight line from left-to-right, whereas others appear staggered. The time it takes a person to recite the numbers after a head trauma may provide insight into whether he or she suffered a concussion. "There has been a need for a rapid, objective screening test for concussion in athletes on the sidelines to determine whether they should return to play," said Balcer. "This test can be given quickly and is not prone to the judgments of the examiner." In the study, published online in the journal Neurology, a K-D test was administered to a group of 39 boxers and mixed martial artists before a sparring match. After a nine-minute bout, the athletes were retested and the time it took to complete the test was logged and compared with the baseline established before the match. A longer, more comprehensive test, called the Military Acute Concussion Evaluation (MACE), was also administered as a means of comparison. Athletes who did not suffer overt brain trauma saw no worsening in their K-D scores, but those who had suffered a concussion on average took six seconds longer to complete the test. Those who had experienced a concussion along with loss of consciousness had even poorer scores. "Any delay should raise a question," said Balcer, a professor of neurology and ophthalmology at the University of Pennsylvania School of Medicine. "What is exciting about these results is that athletes who had head trauma had markedly increased scores. It took them longer to take the test, so there was really not a question among this cohort as to who had head trauma or not." What bolstered the study's findings is that athletes who scored poorly on the K-D test also tested poorly on the MACE test. The caveat: Only boxers who were suspected by a physician of having brain trauma received the MACE test, which may have skewed the study results in a positive direction. According to the study, "among participants who were given the MACE test post fight, five of seven (71%) with overt head trauma failed, while none of those without head trauma failed the MACE." Study authors caution that while the K-D test may provide a quick, objective sideline assessment of concussion, if it becomes mainstream it should be used in conjunction with a more comprehensive analysis of neurologic function by an experienced clinician. "Concussion is a complex type of brain injury," said Kristin Galetta, the study's lead author. "The K-D test is only one test on the sidelines, though, and the diagnosis of concussion requires a combination of tests and the input of medical professionals." "Concussion can involve a wide network of cells depending on what part of the brain was affected," said Dr. Steven Galetta, a co-author of the study, Van Meter professor of neurology and ophthalmology at the University of Pennsylvania School of Medicine and father of Kristin Galetta. "It might manifest with eye movement, but it could also manifest with balance problems or neurological symptoms." Experts in the concussion field expressed a tempered excitement about the prospect of an objective concussion test, but they stressed the importance of replicating this study in a larger study group and among participants in different sports. "This test seems applicable to events where you can do a baseline right before the game," said Dr. Jeffrey Kutcher, a concussion expert and director of the Michigan NeuroSport Program. "That's not always a feasible thing to do, so more study has to be done to look at whether this tool will be valuable in situations where you do preseason baselines. Given the variables, it's possible it won't be as valuable in that situation." Another obvious limitation of the study, according to Kutcher, is its small size, and that athletes sparred for a relative short period of time. Kutcher, who is also chair of the sports neurology section of the American Academy of Neurology, said he would like to see how well K-D works in sports with longer durations such as soccer or hockey, where fatigue might influence test results. What also remains to be seen is whether test results pan out the same way among athletes in other sports, many of which involve subtler blows and different mechanisms for causing concussion from the ones that might occur during a mixed martial arts or boxing match. "Not all concussions are created equal," said Steven Galetta. "We are studying other cohorts of athletes who may not suffer overt head trauma or where there are different mechanisms of concussion. We do need to validate this in other populations of athletes." Despite the study's limitations, Kutcher calls the K-D test "an interesting and a novel approach," and said he plans to try it out on athletes in his own practice. "Any time you have a simple, quick physical exam tool that can help you identify head trauma, it's a good thing," he said. "It is an intriguing possible tool for concussions." One of the study's authors, Steven Devick, is the patent holder for the King-Devick test.